I’ve just come from a lovely out-of-town trip with my husband and our lifelong friends and was offline for 2 days (I have a wonderful life outside FB—unlike a lot of these keyboard warriors. Such losers.). I only got home now, logged in and saw all the trash on my wall. And I see that monsters of the disente variety have descended on my wall and used it as a way to spread their particular gospel of hate. I haven’t read a lot. Just a handful—and the rest, I will ignore and/or delete. Once I find the time. There are only 6 opinions that matter to me in the whole world. That would be my husband’s, my 3 children’s, and my 2 dogs’. Recently, the big news was the admin's latest illegal drug campaign score wherein a staggering P6B in street value, high grade Shabu were seized by the NBI in San Juan. Again, P6 BILLION worth of illegal drugs that were supposed to be circulated nationwide! It was the BIGGEST drug bust in the history of this country. If not caught, and the syndicate assigns P10,000 worth of the drug to one pusher, there would be 600,000 pushers plying the trade across the archipelago! Allow me now to raise an issue. 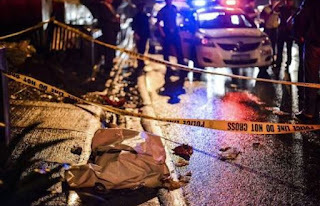 Somehow, somebody seem to be flying under the radar in our current scrutiny of who in government perpetuated the rise of the narco trade in our country. 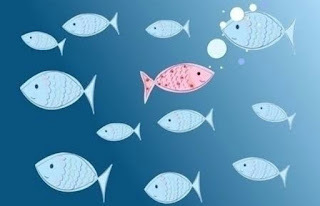 It seems we are missing out on one big fish, who actually was the one who was in full control of the law enforcement agencies and local government units when this destructive trade was prospering. 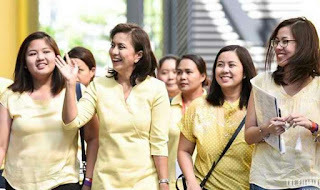 No excuse for Leni Robredo's absentee "vice presidency"
In 2013, the Leytenos were enraged when their leaders were not around before, during, and after Yolanda. The Yolanda issue was a litmus test, and became both the downfall and the rise of many of our politicians. Mar lost the Presidency and Digong won it in huge part because of Yolanda. Mar lost his credibility when he failed during the relief and rehab phases. Digong earned major brownie points for being one of the first government workers to be on the site of ground zero. Here was a local mayor capable of greater things was a message that reverberated and heard and understood around the Philippines. 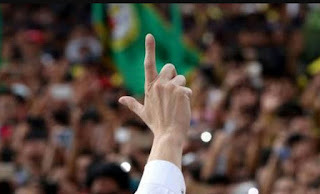 President Aquino was slammed for his politicking and the government's tragic failure in fixing the problem. Binay had the chance to make his mark, but he never saw the golden opportunity to show his leadership in the aftermath of Yolanda. 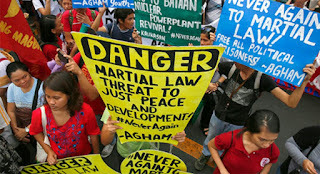 The threat of a return to Martial Law and one-man-rule is the worst Christmas gift to the Filipino people. To refer to specific provisions in the 1987 Constitution prohibiting such as a “reckless reaction” to the Marcos regime is an insult to the experience of the Filipino nation that endured great suffering and hardship under the Martial Law regime. 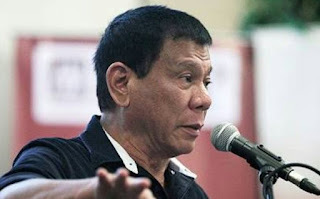 Moreover, for President Duterte to challenge the democratic safeguards of the very constitution he swore to uphold on June 30, 2016 is appalling. Let us remain vigilant against the threat of Martial Law, and fight against any move that will curtail our freedoms. This is not a battle we will take sitting down. As Filipinos, we have demonstrated our courage to stand up and make our voices heard for the sake of protecting our freedom and fighting for the truth. I grew up in a community along Aurora Blvd. near Kanto Katipunan in Quezon City in the Philippines during a time when most of us treated each other like Family. We went outside to play, we got dirty and we didn't eat fast food....we ate fried bananas and boiled sweet potatoes, fresh vegetables and home cooked meals. 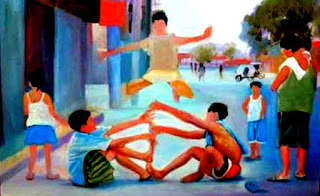 We played Taguan, Habulan, Agawan Base, Mother May I, Touch The Color.., Jack Stones , Marbles, Tex, Bahay-bahayan, Luto-lutuan, Chinese Garter, Patintero, Piko (hopscotch), Shato, Tubigan, Chess, Chinese Checkers, Roller Skated, Scootered and raced against each other in the street. There was no bottled water, we drank from the garden hose. We watched cartoons on Saturday morning and lolo's favorite 'Oras ng Ligaya' in the evenings on our black & white TV. The 'Wild, Wild West' was lola's choice. 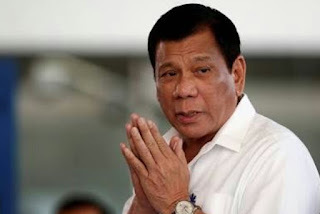 "Sick" Duterte still 100x better than Noynoy in good health! Dear yellows. President Duterte appointed achievers like Gina Lopez, Secretaries Piñol, Taguiwalo, Evasco, passed a national budget, curbed crime, charted an independent foreign policy, strengthened the morale of our security forces and we look forward to a super charged economy with lower taxes and massive corrupt-free infrastructure spending. Now you're telling us he is sick. You know what this means right? That even an alleged sick and debilitated President Duterte is better than your Noynoy in full health. Get it? Darwin Canete as posted on Facebook. 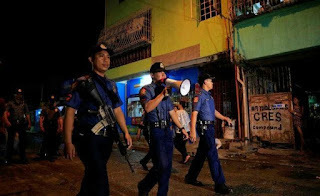 Support Duterte's War on Drugs and crack down on crooked cops! 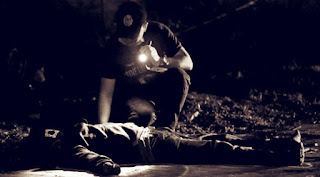 Heartbreaking stories of addicts turning themselves in at police stations only to be shot dead in their own homes weeks, days or even just hours later. A seemingly endless stream of accusations from the families of defenseless victims with the same narrative: the drugs and guns were planted after the murder. Over and over, we hear the painful cries from loved ones saying they didn't fight back and were never going to. The biggest obstacle of the War On Drugs isn't shabu. At this point it's not even the drugs themselves. It's the corruption in a national police force that runs so deep and involves officers on all levels who are now in an intense and desperate rat race to kill the powerless to self-preserve. 1) Poverty is the main problem of the poor. 2) Pro-poor is fighting the eradication of poverty. Obviously. 3) Excessive bureaucracy or red tape is the cause of the delays (e.g. Yolanda housing). 4) Opposition means to oppose only that which you do not agree with. 5) Holding one board meeting makes you the hardest working HUDCC chair. Ever. 7) Talking about your knees is offensive but being touched on your shoulders, chin, hair and hands is not. Rocky Gonzales as posted on Facebook. 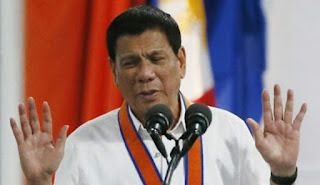 Call for Duterte to resign and hold snap elections as Opposition steps up anti-admin attack! Amazing how Tatad can go insane over Duterte's first six months as opposed to Aquino's six years. 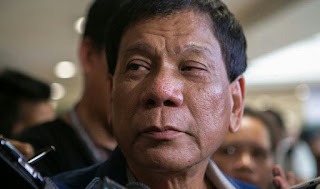 Is Duterte really that bad a President or is he that good which is why he merits being asked to step down or kicked out of office? Even the SWS can't make his approval ratings go below 65% even now that they're using net approval ratings as their basis of reference. We would like to correct several unsubstantiated claims made by Ms. Lorraine T. Badoy on Facebook. According to her post, a supposed "HUDCC employee" informed her that Vice President Leni Robredo did not meet with Key Shelter Agencies until October 2016. VP Leni had briefings with Key Shelter Agencies (KSAs) beginning with HLURB on August 26, 2016. This was followed by briefings with NHA on August 31, 2016, SHFC and HDMF on September 16, 2016, HGC on September 28, 2016, then NHMFC on October 5, 2016. VP Leni also attended the Senate Committee hearing on the housing sector's budget together with all the heads of the KSAs on September 7, 2016 as well as the plenary budget deliberations for HUDCC and the KSAs at the House of Representatives on September 30, 2016. In addition, she met with all KSAs on September 19, 2016, to discuss the agencies' planned response for the victims of Typhoon Ferdie in Batanes. 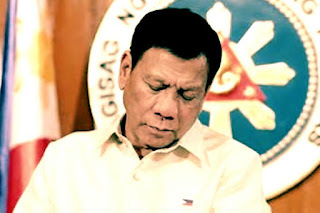 What’s going on now in the Duterte admin is like a replay of how the yellows and the US engineered Marcos’s downfall, except this time, Pinoys have their eyes wide open. It’s like God is letting us relive what went on in 1983-86, so we will know what happened outside the one-sided yellow narrative we’ve been taught to believe for 30 years. For example, word has it that Leila de Lima was seen at the US embassy visa interview section a day or so ago, a short while before she announced that she was going to the US and Germany to speak at some international human rights conference. Guess who is the biggest financier of these international human rights organizations who organize these conferences? If De Lima was processing her visa only a few days before her departure, it’s very possible this trip and speaking engagement were arranged at the last minute. 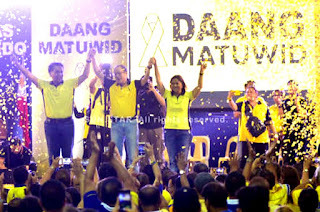 ROBREDO'S ACCOMPLISHMENT REPORT: Note the verbs used. * "Cut red tape..." No mention of performance indicator like reduction of processing time in hrs/mins. * "Pushed for construction of 17,000 houses..." This is meant to deceive. "Pushed for" is different from actual construction of houses, right? This is crap. Bureaucrat language. In short, she accomplished almost nothing. Government officials should be required to present their Key Result Areas and actual results. 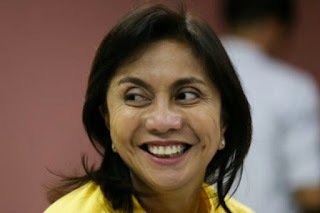 If I were the President, I will transfer Leni to Tourism, as Head of Wanda Teo's admin services, without cabinet rank. That's how I see her skillset. Honestly. Adolfo Mortera as posted on Facebook. A media blitz is "a campaign of intense media coverage for the purpose of advertising or publicity." ie: "The Opposition launched a media blitz to discredit Duterte and present a good 'alternative'." In Tagalog, ang media blitz ay isang masusing kampanya para ipalaganap ang isang adhikain. This, my friends, is what you call a media blitz. On NYT, we have the extrajudicial killings. On BBC, we have a story on "trolls" defending Duterte. 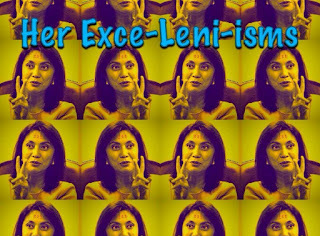 On QZ, we have Leni as the "even tempered" alternative. On CNBC, we have "the opposition leader." 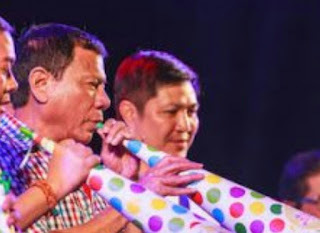 What have Filipinos achieved after 30 years of "freedom" under a "democracy"? Truth to tell, back in 1986, I was yellow. I was 17, so enamored with the idea of a Ninoy Aquino presidency that never was. And how I hate those damned Marcoses. I got my real stories on politics via the underground media back then, especially the reformatted Mr & Ms magazine, which became the Inquirer of today, and Veritas. Another source was my favorite teacher back in HS, Ms Isabelita Viray, wherein we will discuss the Aquino-Marcos rivalry in a Math class. Kris Aquino was still a cute bespectacled teen, and one could only wish that she stayed that way all throughout. But then... oh never mind. Mareng Winnie finds it convenient to harp on the physical and mental health of Duterte. 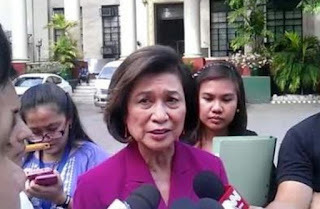 ...the President’s mental and physical health is certainly cause for grave concern for the Filipino people. Who are his doctors? What do they say about it? 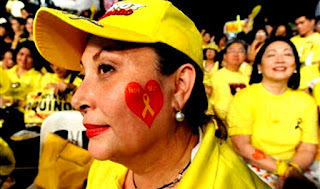 But during the campaign for the 2010 elections, she vehemently protested the request to make public the psychiatric evaluation of then candidate Noynoy Aquino when Sen. Alan Cayetano questioned it. 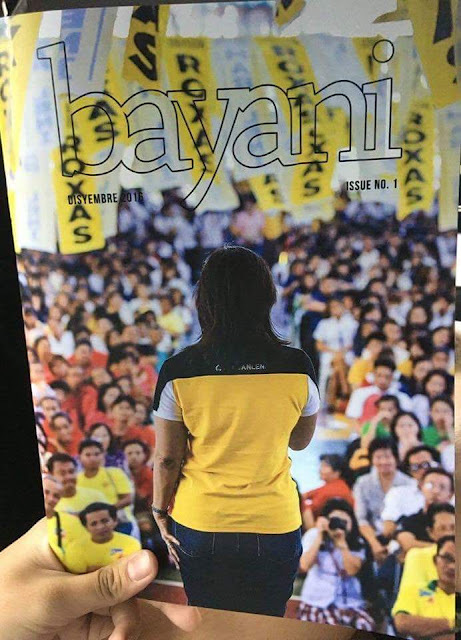 The Yellowtards are now scraping the bottom of the barrel to find issues with which to discredit the President. It was Rappler which first posted about this. They assumed that Elizabeth Zimmermann would bad mouth her ex husband in public to derail his candidacy. 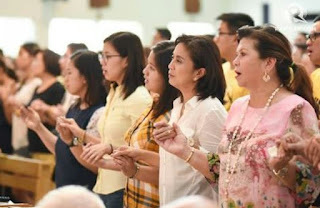 To their surprise and consternation, she even rose from her sickbed to embark on a bus tour of Mindanao and the Visayas to campaign for her ex husband. But what's really amazing is how Mareng Winnie's husband was able to put up with her. 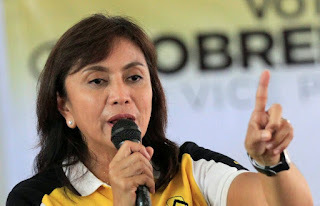 I’ve been getting a lot of hate mail recently because I’ve criticized VP Leni Robredo. A lot of friends have told me how I am being tarred and feathered in other people’s walls and some of them have even shown me screen caps. Screen caps I don’t bother to look at. And I don’t look at them because it doesn’t matter to me one bit what they say. The language of hate is wounding and I have more than enough wounds on my plate, thank you. If I’m going to get wounded at all, it’ll be by the hands of people who matter to me. Not strangers I care nothing for. But also, I have a deeper understanding of my freedom. 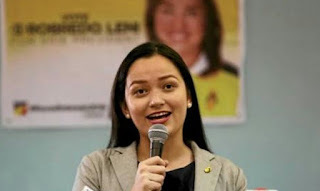 The call of Loida Nicolas Lewis for President Duterte to resign and step down from the Presidency effectively signals the start of hostilities between the Dutertetards and the Yellowtards. 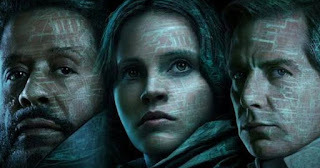 Let's speculate on what may be the outcomes given several scenarios. What position will the Left take? Will they join forces with the Yellowtards and break off from the peace talks which has only progressed this rapidly under Duterte? Or will they accept Duterte's uncompromising stand on the Marcos burial and go on to forge a peace agreement for the first time in forty-eight years?